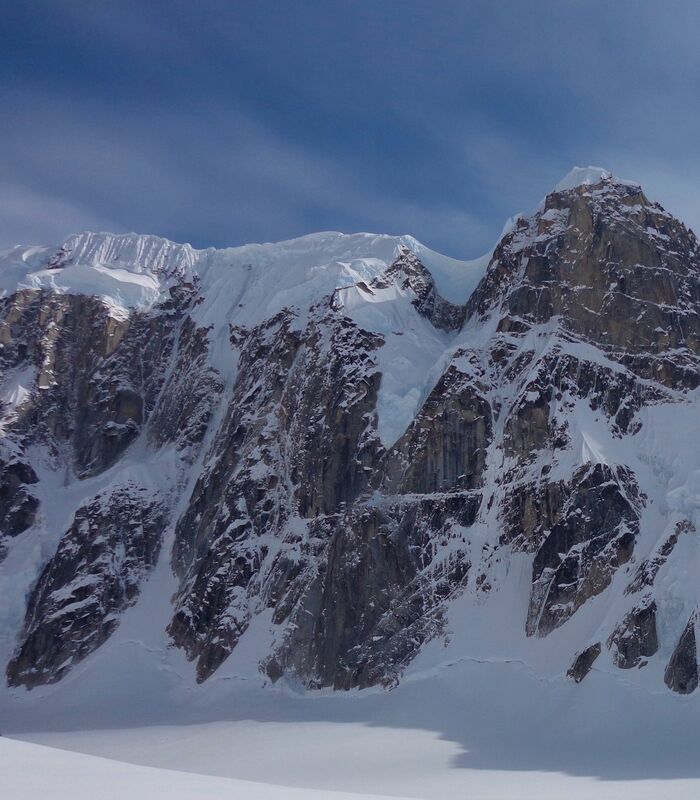 Rescue teams searching for a pilot and four passengers who crashed high atop a ridge deep in the Alaska Range in Denali National Park were unable to spot the crash site Sunday because of terrible weather, an official said. The attempted rescue began Saturday night shortly after the crash occurred and has been prevented so far by thick cloud cover. Search crews are hopeful they'll be able to reach the site Monday morning, said Katherine Belcher, a spokeswoman with the National Park Service, on Sunday night. The crashed plane is a de Havilland Beaver operated by K2 Aviation out of Talkeetna. It's believed to have crashed around 6 p.m. Saturday at about a 10,500-foot elevation at a location known unofficially as "Thunder Mountain." Two HH-60 rescue helicopters operated by the Alaska Air National Guard launched shortly after 1 p.m. Sunday were unable to spot the crash site, she said. "The helicopters were not able to make any kind of visual contact or get close to the area," Belcher said. "They'll try again at 7 a.m, depending on the weather. There's supposed to be a small window of opportunity to get closer and hopefully lay eyes on the crash." The crash occurred near the 10,920-foot summit, Belcher said. The area was described by the park service as "as extremely steep and a mix of near-vertical rock, ice and snow." The pilot of the downed plane made two satellite phone calls to the company's airport office Saturday night — one right after the crash and another around 7 p.m., Belcher said. "The pilot reported injuries, but the extent is unknown," the park service said in a statement Sunday. The Beaver is reported to be equipped with emergency supplies, including a first aid kit and survival gear including food and sleeping bags. Belcher said the weather at the crash site will definitely fall below freezing Sunday night. Throughout the day on Sunday, the winds were blowing in the area at 25 mph to 35 mph, with gusts up to 60 mph, further complicating the rescue efforts, she said. She said she did not know why the pilot had not made any satellite calls since Saturday night. The plane's electronic locator transmitter continues to convey a signal, indicating the plane's location remains at the altitude where it struck the mountainside. Belcher said an Alaska Air National Guard C-130 circled the site Sunday, relaying weather information back to a ranger station in Talkeetna. The town, about 90 miles north of Anchorage, is the home of K2 Aviation and a jump-off point for flightseeing tours in the Alaska Range. The names of the pilot and passengers had not been released as of Sunday afternoon. Thunder Mountain is about 14 miles southwest of the summit of Denali. 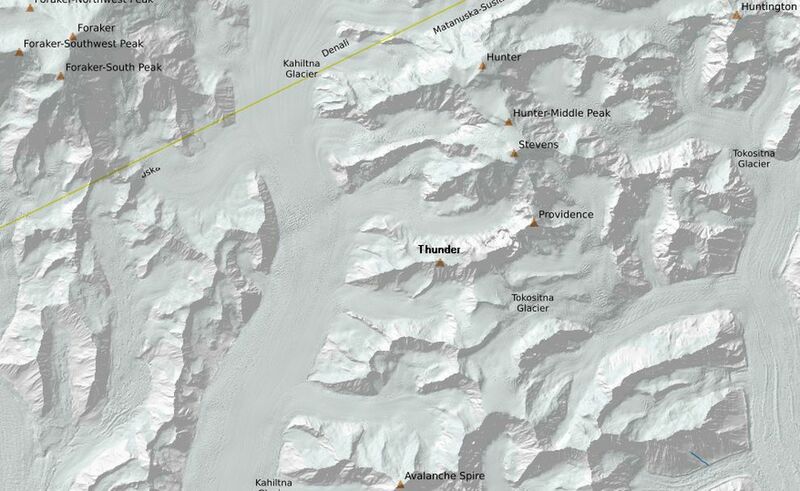 "Thunder Mountain is more of a ridge than a mountain, stretching roughly a mile long from east to west and rising about 3,000 feet above both the Tokositna and Kahiltna glaciers," the park service said. "The knife-edge ridge that constitutes Thunder Mountain extends easterly to become a southern ridge of Mount Stevens, formerly known as the South Peak of Mount Hunter. Terrain in the vicinity of the crash site is characterized as extremely steep and a mix of near-vertical rock, ice and snow." A park service helicopter launched at 8 p.m. Saturday to search the area and was able to fly within a mile of the plane's GPS coordinates, but cloud cover prevented the crew from spotting the crash and they weren't able to make radio contact, the park service said. Air National Guard helicopters as well as two K2 planes flew to the area Saturday night but were also unable to see or communicate with the downed plane. The search resumed Sunday morning at around 5 a.m., but weather has been "the deciding factor" preventing aircraft from reaching the site, said David Bedard, a spokesman with the 176th wing of the Air National Guard in Anchorage. Pilots had been unable to see through the "soup" of cloudy weather, he said early Sunday afternoon. Agencies plan to stage a four-member ground crew near the base of Thunder Mountain when weather permits. But "a ground ascent of Thunder Mountain is not considered an option due to significant rockfall and unstable snow and cornice conditions at this time of the year," according to the park service. Belcher, with the park service, said the tour plane took off Saturday from K2 Aviation shortly after 5 p.m. The weather around the crash site was reported as cloudy but calm at the time of the accident, Belcher said. Belcher said it appears the flightseeing tour was wrapping up when the crash occurred. "We think they were coming back (to Talkeetna) because they were heading southeast," Belcher said. A spokeswoman for K2 Aviation, Jennifer Thompson, emailed a statement late Sunday afternoon saying the company has canceled flight tours until further notice. K2 said it's fully cooperating with multiple agencies involved in the response, including the National Transportation Safety Board that will investigate the accident. The company is also awaiting updates on the rescue. "The entire K2 family sends their thoughts and prayers to the families of our guests and the pilot involved in the incident," the statement said. "We are extremely grateful for the support of our community both here in Talkeetna, and from our tour partners everywhere."